Grandeur Palace’s early bird pricing certainly brings a crowd with anything selected from the small, medium or large category costing the same as small (after 11:00 am it’s $2.90 for small, $3.90 for medium, and $4.90 for large). Also added to the bill, regardless of whether you actually drink the tea, is $1 charge per person. However, with the deal comes a long queue and it’s even longer at Grandeur as they have a lot of friends and family who end up skipping the line. Just be warned, be patient, you’re in for a wait. 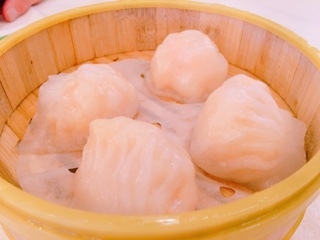 The house special shrimp dumpling (L) or har gow seems to continuously get bigger - a golf ball size at Grandeur and incorporating ample amounts of large crunchy shrimp. The wrapper, although thin, was sticker than normal, but given they use large bamboo steamers they were kept apart. 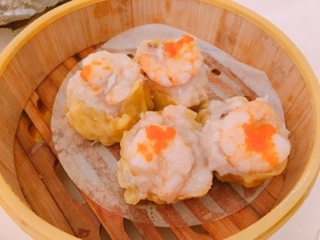 Although there’s a longer wait for the shrimp siu mai (L), the other traditional favourite, it’s plump and juicy with a large shrimp and fish roe on top. 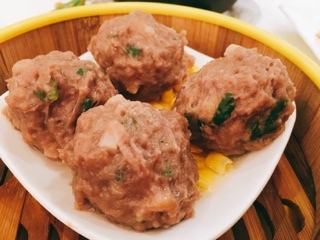 The steamed beef ball with cilantro (S) is harder than most (not necessarily a bad trait, just depends on your preference of texture) and studded with ample amounts of cilantro so you can really see and taste it. For those who detest the herb, most are in large enough leaves that you may even be able to pick them out. 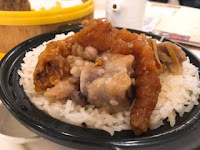 For a filling finish, a pot of the steamed rice with spare ribs and chicken feet (L) is in order. It’s a smaller size but certainly brimming with meat on top. It’s smart to serve the fisherman congee (L) in the same casserole pot. Yes, it’s smaller, but at least resists getting cold. 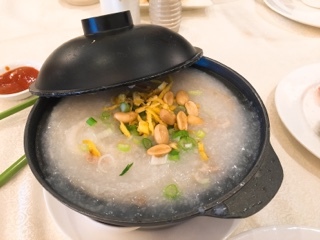 Unless you’re familiar with this congee, the name isn’t descriptive and would lead someone to think it’s filled with seafood. Indeed, there are pieces of rehydrated squid, but you’ll also find non-sea items such as pork rind, pork stomach, lettuce and peanuts. Trust me, they’re not stingy with their ingredients. If you’re like me and generally like the sticky rice in lotus leaf with chicken and dried scallop (L), the version at Grandeur is respectable and delicious. 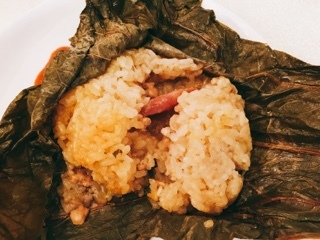 However, their eight treasure preserved meat glutinous rice dumpling’s (L) filling contains a lot of ingredients, rather than the skimpy amounts at other restaurants. It’s worth trying despite being harder to share. 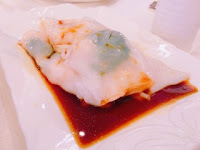 The green onion dried shrimp rice roll with Chinese cruller (M) didn’t have much within the silky rice noodle and even the accompanying sesame and hoisin sauces were minimal. 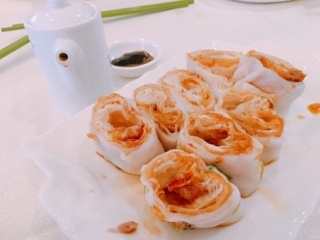 If you like seafood, the shrimp ball rice noodle roll (L) is a better choice and even incorporates a bit of snow pea shoot leaves for interest. Grandeur has a lot of pan fried dishes available. 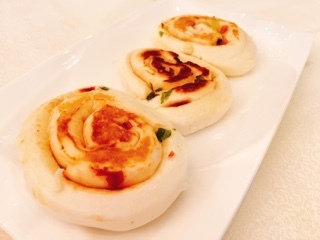 The green onion flower roll (M) looks nice but is bland. Aside from the green onion there’s shrimp paste smeared onto the soft flour roll but nothing is salty – you just get whiffs of the aroma. 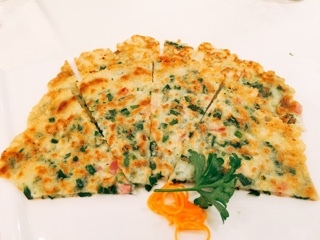 Something flavourful is the Chinese chives pancake with lunch meat (L) or better known as Spam, which also arrives shaped like a tasty meaty fan. The pancake uses a glutinous flour base so it’s chewy and thin, the edges immensely crispy. 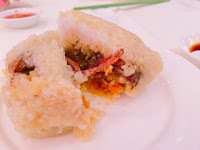 The crispy eel pastry (L) was flavourful and if cooked longer could be really tasty. However, on our visit the pastry was under cooked so still soft, pale and slightly floury. 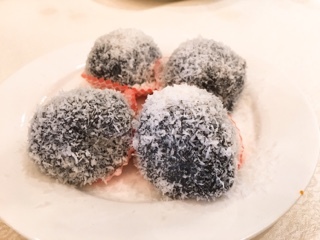 Despite its long description, the red bean sticky rice cake coated with shredded coconut and black sesame would be better described as glutinous black sesame sticky rice cake with red bean paste and covered with shredded coconut. 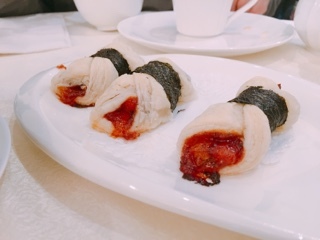 They tasted fresh with a nice soft texture and plenty of sweet paste in the centre. 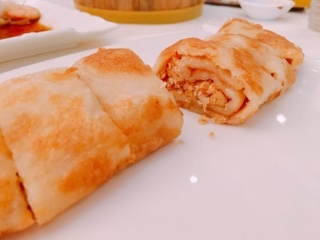 The peanuts sweet pancake (L) is rather delicious, a thicker version of the chewy glutinous pancake rolled with crushed peanuts, shredded coconut and sugar in the middle. After a quick kiss with an oily pan it’s piping hot and had a nice golden crust. 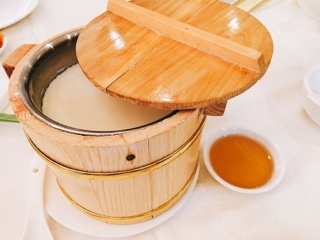 For larger groups the sweet tofu pudding (M) is a great deal coming in a large container and would fill at least six of the smaller bowls. A long delay for final dishes: after the first succession of dishes, there’s always one or two straggling ones that seem to not come until you finally flag someone down to follow-up with it. Possibly one of the reasons that causes the long wait, which is exacerbated by their leniency with letting in walk-in friends and family. Certainly, other Chinese restaurants also have this practice, but it’s generally not as blatant: most will time it better by calling a series of table and then sneaking in one relative. At Grandeur, you can see them standing along the side and bar area and simply being led to empty tables so only one or two numbers are called despite hoards of patrons leaving. Be warned now: if you hate waiting don’t go during the early bird special. Or if you want to protest against their practices, don’t go at all. However, if want to visit and aren’t patient, head there after 11:00 am – you’ll pay more, but the frustration just isn’t worth it.